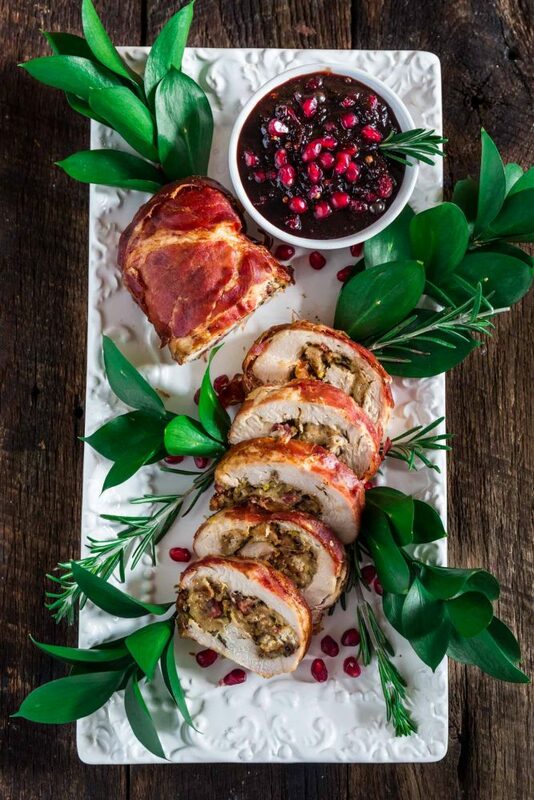 Who needs a traditional turkey recipe for the holiday season when you can make this prosciutto wrapped turkey roulade? Drizzled with a pomegranate-port reduction and filled with a pistachio cranberry stuffing, this extravagant meal is a delicious way to get every ounce of holiday flavor in one bite. The perfectly balanced sweet and salty Prosciutto di Parma and tart pomegranate make for a delicious duo and while it may seem difficult, the end result proves it was worth the time and effort. This dish is sure to convince you that a prosciutto wrapped turkey roulade is the only way to enjoy the holidays. Pair with a deep red wine to further bring out the rich flavors of this meal. This recipe comes from Olivia’s Cuisine, who was inspired by her visit to a prosciuttificio in Parma, Italy. Place the bread cubes on a baking sheet and bake until dry, about 10 minutes. Keep the oven on and transfer bread cubes to a bowl. In a large skillet, over medium heat, add the pancetta and cook until it releases fat and turns golden brown, about 2 minutes. Add the onion, celery, garlic and herbs and cook until softened, about 2-3 minutes. Add the butter and let it melt and moisten the veggie mixture. Transfer the pancetta veggie mixture to the bowl with the bread. Add the cranberries, pistachio and broth and stir until the bread is moistened. Season with salt and pepper to taste. Place the turkey on a work surface and run a sharp knife parallel to the counter, starting on the thicker side, cutting the turkey almost completely in half without cutting all the way through, like a butterfly. Cover with plastic wrap and, using a meat mallet, pound the turkey breast to a ½-inch thickness. Remove plastic and season generously with salt and pepper. Spread the stuffing on the prepared turkey, leaving a ½-inch border all around. Starting with a short side, roll breast in jelly-roll fashion into a log. Place seam side down on a baking sheet. Drape prosciutto slices over turkey breast, overlapping slightly to cover completely. Use kitchen twine to tie in 2-inch intervals. Roast, uncovered, until a meat thermometer inserted in the thickest part registers 165F degrees, about 45 minutes to 1 hour. Remove from oven, cover and let it rest for 10 minutes before slicing. In a large saucepan, over medium heat, melt the butter and cook the onion and garlic until softened and fragrant, about 2-3 minutes. Add the peppercorns and continue cooking for another couple of minutes. Add the port wine and cook until most of it has evaporated. Then, add the chicken broth, pomegranate juice, molasses and brown sugar. Turn the heat up to medium high and cook the sauce until reduced to a sauce consistency. Season with salt and pepper and transfer to a serving dish. Add the pomegranate seeds and serve with the turkey. Note: Unlike a whole turkey, the turkey roulade can be made one day ahead and refrigerated, wrapped in plastic, until ready to roast.